Nikon D5000 Digital SLR Camera offers breathtaking 12.3-megapixel image quality, along with a flexible, Vari-angle, Live View monitor for fresh picture-taking perspectives, and also offer remarkable blend of simplicity and highly advanced D-SLR capabilities. Coupled with Nikon’s EXPEED image processing and NIKKOR optics, breathtaking picture quality is assured. Legendary NIKKOR optical quality features Nikon VR image stabilization for added sharpness. 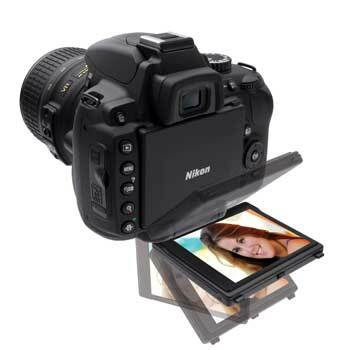 Record 720p HD movie clips enhanced by NIKKOR interchangeable lens quality and versatility. Position the 2.7-inch monitor freely for fresh shooting perspectives. Screen flips inward for safe keeping. Capture stunning photos in challenging picture-taking situations including Sunsets, Candlelight, Silhouette, Portrait, Landscape, Beach/Snow, and more. Easy Live View access offers 4 autofocus modes, including Face Priority AF. Combined with fast power-up and split-second shutter response, decisive moments are captured easily without annoying shooting lag. Engineered for exceptional low-light shooting. Effective 4-frequency, ultrasonic sensor cleaning keeps images spot free. Fast and accurate autofocus delivers razor sharpness. Restores lost shadow and highlight detail in high contrast exposures—Selectable and Auto modes available. Creative in-camera image editing, featuring Soft Filter, Straighten, Color Outline Effect, Perspective Control, Red-eye Correction, Image Overlay, Monochrome and more—all without a PC. Standard, Neutral, Vivid, Monochrome, Portrait, Landscape and 9 customizable settings. Nikon’s renowned 420-pixel RGB 3D Color Matrix Metering II, teamed with the exclusive Scene Recognition System, evaluates each scene for unmatched exposure accuracy. Testing to over 100,000 cycles assures precision and long shutter life. GP-1 GPS unit (optional) automatically identifies and records every image’s latitude, longitude and altitude, with satellite time-of-day. Next PostNext Harley-Davidson® Men’s 105th Anniversary Tee Shirt – LIMITED EDITION.